Susan attended Paier School of Art in Hamden, Connecticut, majoring in illustration and fine art. She has also taken various classes at Rhode Island School of Design and has been a working artist since 1975. Her interest in rendering birds, particularly waterfowl, was sparked by her first art-related job illustrating a weekly column “Wings ‘N’ Things” for the Waterbury Republican newspaper in Connecticut. Soon to follow was Birds of Connecticut Salt Marshes, published by the Arboretum at Connecticut College. Since then she has illustrated many more books and scientific journals, worked as a graphic artist and illustrator and exhibited in galleries including the Maritime Gallery at Mystic Seaport, Noah’s Art at Noah’s Restaurant in Stonington, Connecticut, Hartford Fine Art and Framing in East Hartford, Connecticut and Picture This Gallery in Westport, Connecticut. Susan relocated from Westerly RI to Florida in January 2010. Watercolor is her favorite medium followed closely by pen & ink. Upon entering her first show in Florida, The Titusville 46th Annual Spring Show 2010. More recently, Susan wont the Downtown Gallery Award at the Titusville 50th Annual Apring Show for “Antique Bottles. She received a merit award for watercolor for “Rosemary’s Wool”, a piece which also received an Honorable Mention at the Mystic Art Center’s 51st Juried Regional Show in September 2009, Second Prize at the H2O Show of the Portsmouth Arts Guild in November 2007 for Taking Flight, the Ann Lewis Parker Award for Best Watercolor for Behind the Wall at South County Art Association’s Open Juried Show, as well as honorable mentions for On the Morgan I, and Light at Mystic. She also received an Honorable Mention for Barn Owl at The Wickford Art Association. A book she recently illustrated, Kid’s Easy-to-Create Wildlife Habitats, written by Emily Stetson, won a 2006 Teachers’ Choice Award and received critical acclaim in the School Library Journal. She was accepted into the prestigious 2006 International Show at the Maritime Gallery at Mystic Seaport in Mystic, Connecticut. In addition to natural history, Susan is an accomplished artist of architectural subjects and is able to render a detailed drawing from blueprints or from life. She accepts commissions for custom drawings and watercolors of homes and businesses and pets. 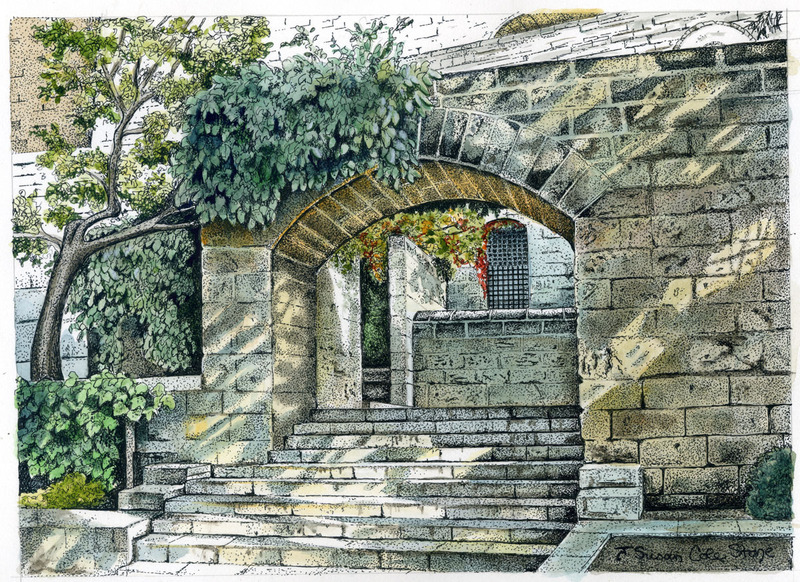 She also teaches classes and workshops in perspective drawing, watercolor, and colored pencil as well as workshops in various aspects of these mediums and disciplines. Susan is the Executive Director at the Art Gallery of Viera in Viera, Florida, a longtime member of the Artists’ Cooperative Gallery of Westerly in Rhode Island, an Elected Artist member of the Mystic Art Center (formerly Mystic Art Association) in Connecticut, and an artist member of the Brevard Watercolor Society.